If you have set your heart on getting married on the beach you will need to plan carefully to make your day as perfect as you imagine. Sinderella Wedding Studio will have private beaches to get married on so you can get privacy. Also we will have facilities. - such as shade, drinks etc which will make the ceremony go smooth for everyone. 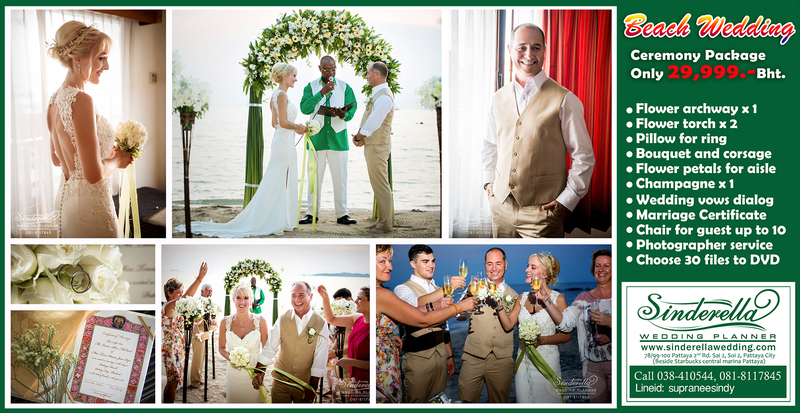 For a ceremony on the beach you can achieve some really beautiful decoration to make the day really special. It is wise to use an expert local wedding planner to help with this & the legal side - in many locations there are some truly talented wedding planners that can create wonderful beach wedding decorations - but it is often possible to arrange everything yourself. Planning what to wear is important - light fabrics are essential - both for the bride & groom as well as the guests. Flat footwear - not always popular with the guests - is also essential. Keep in mind to have lots of liquid to keep everyone refreshed.